Kat Martin recorded from the Sakurajima live cam an unusual bright light near the bottom of Mt. Sakurajima on June 20, 2018. Kat was watching the live cam at Sakurajima volcano and noticed a light source coming from the ground near the bottom of the mountain. It grew so large it lit up the sky then shrunk back to the ground. At one point another small light source appeared above the mountain, flashing on and off. Kat said that she has never seen anything like this before. 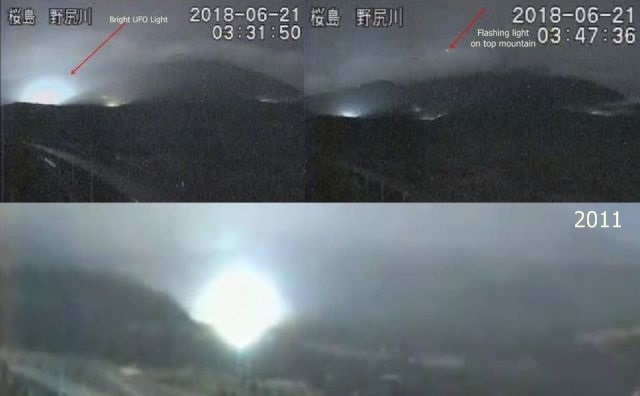 The 2018 UFO light is similar to the mysterious UFO light that appeared on the Sakurajima Live cam in 2011. Till today they still have no explanation for the 2011 event. Mt. Sakuranjima is well known for its mysterious UFO sightings. First video: UFO lights 2018. Second video: UFO lights 2011.